I must warn you that there are SPOILERS ahead for the entirety of NML. If you DON'T want the story ruined, then I would break off in December. --Circa October 7: Two-Face has been holding Renee Montoya hostage for the past (nearly) four full months (since "Fruit of the Earth" circa July 7) and her family for ten months (after some business with Killer Croc), if you want to call it that--more like house arrest, Two-Face and his goons (led by Tally Man) attack the GCPD headquarters and put Gordon under arrest, meanwhile--Batman and Robin discover Penguin has made a deal with someone (Mercy) representing the Outside Interest to ship in tons of...building supplies (?) in exchange for helping Penguin with his illegal pipeline to the outside and then are alerted by Oracle to the GCPD situation, Two-Face has Montoya (who he has a crush on) dress up in a bailiff's uniform in order for him to put Gordon on trial for war crimes [Batman #572], while Gordon is put on trial, Batman and Robin arrive at the GCPD headquarters where Tally Man and Two-Face's men have taken Essen, among others hostage�Two-Face questions both Montoya and Gordon (he thinks Gordon should be punished because he didn't hold up his end of the bargain)�should he find Gordon guilty, the punishment is death�but Gordon asks Harvey Dent to defend him against Two-Face, the result is a strange cross-examination in which Dent defeats Two-Face�Gordon is freed, Montoya arrests the "guilty" Two-Face and Gordon arrives home to find that Essen has been saved by Batman, Robin, Batgirl, and (making his second appearance in a mainstream Batman comic since the end of Knightfall) Azrael�Gordon agrees to talk with Batman [Detective Comics #739]. --Circa October 8, pre-dawn, 3 hours later: Gordon and Batman stare at each other, each presumably unsure what to say to each other while Oracle and Robin are trying to hack their way into discovering who paid for the mysterious construction supplies (the Outside Interest)�after discussing their situation and trying to work out the semantics of their relationship, Batman takes his mask off to reveal his identity, but Gordon looks away�he demands that Wayne put his mask back on, implying that he already knows his identity�Batman complies, pleading with Gordon to help him take back his city�Gordon agrees to meet with Batman circa October 9 at sunset to plan [Legends of the Dark Knight #125]. --Circa October 29: Joker is watching TV where it is revealed that negotiations to end NML are underway in DC�the public is turning against the act, declaring it unconstitutional and barbaric [Shadow of the Bat #93]. --November 8: Batman and Oracle discover who the Outside Interest is, Gordon comes clean with Essen about his involvement with Two-Face, Batman stops the Strongmen from trying to execute Two-Face [Shadow of the Bat #93]. -Evening: Batman, Batgirl, and Azrael (!) meet with Gordon�Batman orders Azrael and Batgirl to evacuate the Bat territory and bring them into GCPD protection, Joker works up a plan to get Batman to come to him, Mercy instructs Bane to await her orders, Oracle reports helicopters arriving in Penguin territory�Batman investigates, Lex Luthor (the Outside Interest) has arrived to rebuild Gotham [Shadow of the Bat #93]. --Midnight or so: Azrael and Batgirl are sent by Batman to evacuate north Gotham and bring them GCPD territory, while convincing people to leave for GCPD territory, they run into "Joker" (actually one of Joker's goons dressed to look like him) and some henchmen, Joker and Harley take a hostage�Azrael plays a trick on Joker (he thinks its another fake Joker instead of the real one) and gets him to release his hostage long enough for Batgirl to get the girl and escape�Azrael and Batgirl leave, not knowing that they had just confronted the REAL Joker and walked away from him (doop!) 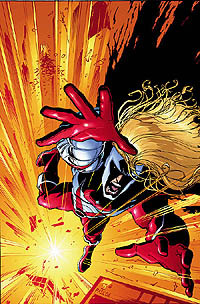 [Azrael #60]. --November 9: Luthor says he is going to begin rebuilding Gotham�now�with or without the government's approval while galvanizing public support through the media, Robin is sent to monitor Petit and Huntress, Joker rages about the lack of attention he is receiving and the second-stringers Batman throws at him, Huntress and Foley muse that Petit might be losing it (over his attempt on Two-Face's life which happened yesterday), Batman drops in to pay a visit to Luthor�Luthor summons Bane [Batman #573]. --November 10: Bruce Wayne gives a call to Lucius Fox where it is revealed that should NML be lifted, the majority of the land holdings would revert to its previous owners�not Luthor, Robin listens in on a raving Petit [Batman #573]. 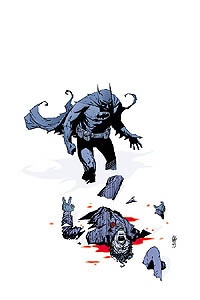 --November 11: the re-construction of Gotham continues (Luthor having annexed Penguin's territory) and everything seems to be going along Batman's plan�but then Joker starts to make noise [Batman #573]. --November 17: Luthor continues to rebuild Gotham, even though the US government has filed four injunctions against him and frozen his foreign assets, Joker and his men have been ransacking Luthor's supplies at various points and Luthor tells Mercy to fix the problem, Batman and Robin muse over the tension in the Strongmen�it appears that Huntress is not thrilled at Petit's Gestapo tactics�Joker attacks one of Luthor's camps when Bane shows up to "tend" to the problem�Mercy almost kills Joker, but Harley helps her puddin' escape�she decides to let Joker flee, thinking that he's gotten the message, Batman follows Bane home to his trailer and convinces Bane to leave NML�Bane reveals that Luthor has given him Santa Prisca and says he'll leave by the end of the week [Detective Comics #740]. --November 19: the media is pushing an end to NML, Penguin tries to blackmail Lex, but Luthor has Mercy deal with ALL of Penguin's men, leaving Penguin sad and lonely, an Executive Order is signed bringing an end to NML�the army will be arriving to maintain order and Gotham will officially re-open on January 1 [Detective Comics #740], presumably after Luthor's dis to Penguin, he releases Catwoman on Luthor, her orders to steal everything, before infiltrating Luthor's camp, Catwoman sees her former pals (the three stooges who helped her steal the disk) who now work for Lexcorp�Catwoman infiltrates the Lexcorp building and steals a bunch of battlesuits which she uses to steal Luthor's building supplies�Penguin calls Lex and tries to make a deal with Lex to run Gotham's underworld�totally pissed, Lex sends Mercy to finish off Catwoman [Catwoman #76]. --November 20: Luthor agrees to Penguin's deal only if he betrays Catwoman, which Penguin does�but Catwoman blows up Penguin's lair [Catwoman #77]. --Towards the end of November: Catwoman goes steal-crazy, sabotaging Luthor's enterprise at every move, Luthor agrees to a meeting with Catwoman where Catwoman REALLY kicks Mercy's pride (Catwoman stops bugging Luthor simply by having him say "please don't do that anymore" to her)�Catwoman's NML saga ends with her swinging off into the moonlight [Catwoman #77]. --November 29: Gordon and Essen are awakened by the cavalry coming to Gotham to assist in the rebuilding, Joker (who had been mistreating Harley for the past month) suddenly starts choking her announcing that he was about to put on the world's greatest show [Legends of the Dark Knight #126]. --December 4: Lexcorp and Waynecorp (led by Lucius Fox) cooperate on how best to put the city back together, 200 dolls are revealed to have been stolen [Legends of the Dark Knight #126]. 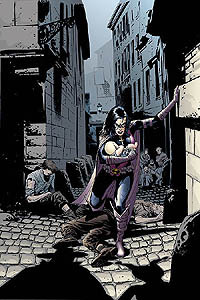 --December 16: Running water, power in the Old City, Batman finds out that the Joker has disappeared and calls a meeting of the team, James Gordon is re-sworn in as commissioner of police in Gotham City, Petit almost shoots Foley, but Huntress stops him, Huntress agrees to stick by Petit to stop him when he finally loses it�Gordon and Batman agree to start combing the city for Joker [Legends of the Dark Knight #126]. --December 21: Montoya is promoted to Detective Second Grade, no one knows where Joker is or what he's up to [Legends of the Dark Knight #126]. --Sometime in the next couple of days: an effort by the government to rescue Tim Drake is launched�Batgirl is sent by Batman to watch over Robin's back until he is safely out of NML�Batgirl helps Tim through a firefight, but he is successfully helicoptered out [Robin #73]. --December 31: Lt. Sarah Essen's funeral and wake, Batman works to break apart Luthor's plans to own all of Gotham, Batman works to protect Lucius Fox from Luthor once Luthor realizes he's been had�Luthor sends Mercy after Fox, but Batman is there to take her down and kicks Luthor out of Gotham [Shadow of the Bat #94]. 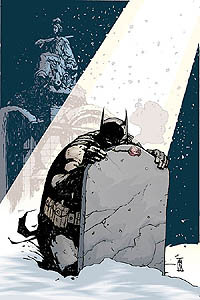 --Midnight, January 1: Nightwing goes to visit Helena (Huntress) at the MASH unit and kisses her, Gordon visits Essen's grave and sings Auld Lang Syne with her as the century closes, and Batman visits his parent's grave to renew his vows�after laying down two roses, he stands triumphantly as fireworks explode behind him�it is the end of a trying, tragic time in his life, but he faces the future and the changes it is certain to bring--for the Dark Knight his quest for justice never ends [Shadow of the Bat #94].